An old variety imported into Europe from Japan in the early 1800s. The flowers are single to semi-double, initially cup-shaped, but opening flat, and are very variable. The petals are usually white, but can also be pale pink, with red and/or pink stripes, flecks and blotches.As is the case with many bi-colour camellias, Tricolor will occasionally produce plain pink or red flowers. The leaves are mid-green, quite serrated and with a distinctive twist. The plant habit is slightly open and spreading, eventually forming a dense bush. 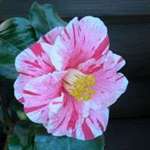 White single form flower with red and pink striping. Spreading habit. Will sport plain colours on occasions. Mid season flowering. The plant arrived in excellent condition , I am extremely pleased with your product, thank you. Plant arrived packaged extremely well and in excellent condition. There are 6 very large buds on plant and looking forward to seeing them flower. Very pleased with the plant would recommend. Really efficient and fast service. An excellent plant and well packaged. Hopefully it will survive the rigours of being planted in a "new" garden with all that suggests. Amongst the phoenix like new builds that have risen from the remains of Manvers colliery. A gift for my Mum, who was delighted that came it came covered in buds.